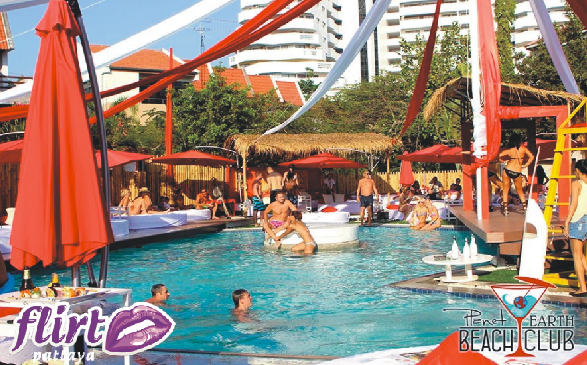 New on the scene is Planet Earth and it has literally taken Pattaya & Jomtien’s clientele by storm. The owners have years of Ibiza club life experience and felt it was time that Pattaya was introduced to the Party lifestyle that is loved by so many people around the world. Here’s an insight of what’s on offer at this chic, trendy and very cool venue. Why not just come along and chill, lay back on a private lounge bed and enjoy the Pattaya sunshine, huge round 6p / 8p / 10p sun beds can be pre booked for you and your friends .. Relax by the pool or stretch out in the Jacuzzi, a calming massage service is also available by professional trained staff. Planet Earth is committed to bringing you the best in excellent service, take a seat at the bar and enjoy a thirst quenching cocktail or an ice cold beer, all at very reasonable prices. Getting hungry? The menu has a wonderful selection of dishes & snacks for you to choose from, there’s also authentic Italian ice cream prepared fresh every day in the poolside coffee shop!!! Music plays an extremely big part in Planet Earth, Live music is on offer and not forgetting the amazing talents of the Resident & International DJ’s that are on call to spin the latest tunes. So as the sun goes down your sure to be up on your feet dancing away to the cool tunes whilst enjoy the beautiful surroundings of PLANET EARTH.